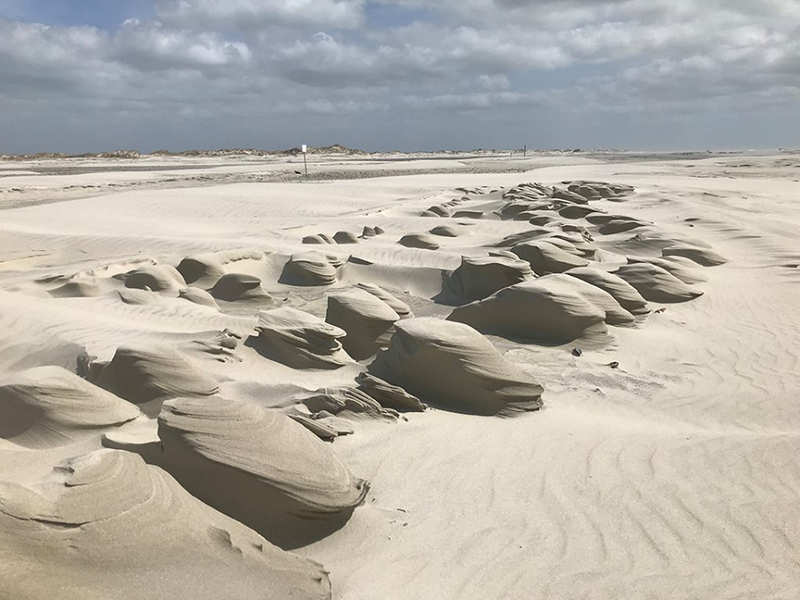 JACKSONVILLE – The North Carolina Beach, Inlet and Waterway Association is rolling out a plan that, if approved, would allow municipalities and private businesses to once again unload sand in federally maintained dredged material disposal areas in the state. Members of the nonprofit, also referred to as NCBIWA and pronounced “N.C. byway,” met recently with officials from the Army Corps of Engineers’ Wilmington district and staff from U.S. House and Senate offices to kick off a campaign that would scale back the nationwide ban on the use of the Corps-maintained disposal sites. The initial move in what is being described as a two-pronged approach is to get the Corps to narrow the ban to deep-draft navigation projects, which are those where a channel is maintained deeper than 16 feet. The Corps’ February 2017 guidance was made to conserve space within its disposal sites after millions of cubic yards of material dredged from non-federal projects were placed in a single dredged material placement facility, or DMPF, in Galveston, Texas. Limiting the rule to deep-draft navigation projects would offer North Carolina municipalities and small businesses the opportunity to dump dredge spoil pumped from shallow-draft projects onto federally managed disposal areas. “In our minds, that would allow Wilmington district to evaluate on a case-by-case (basis), ‘will this project impact future capacity?’” said Robert Neal, NCBIWA treasurer. A majority of North Carolina’s inlets are shallow-draft navigation channels, meaning they are no more than 15 feet deep. 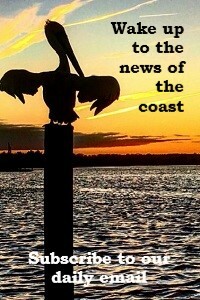 The shipping lane of the Cape Fear River and Beaufort Inlet are the only deep-draft channels in the state. 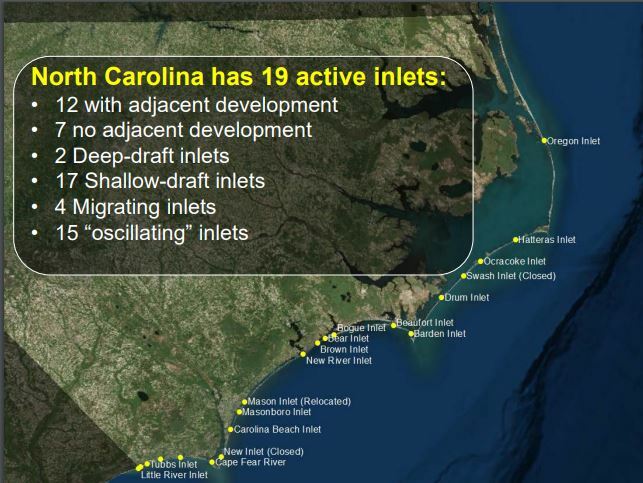 Seventeen of North Carolina’s 19 navigable inlets are shallow-draft inlets, which tend to shoal more rapidly than deep-draft inlets and therefore require more frequent dredging to keep them unclogged and navigable. So far, Wilmington district officials have declined requests from two small businesses and three towns in the state to use Corps DMPFs. 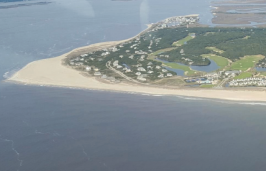 Those projects included maintenance dredging at Ocean Isle Beach, Holden Beach and Sunset Beach in Brunswick County and Bradley Creek Marina and Masonboro Yacht Club in New Hanover County. They included more than 100,000 cubic yards of sand and “potentially” more than $1 million, according to information provided by NCBIWA. That’s just the tip of the iceberg, NCBIWA officials said. Marinas and other small businesses, and several beach towns, including Southport and Oak Island in Brunswick County, Topsail Beach in Pender County and other communities will experience hardships as a result of the policy. Without access to federally maintained disposal areas, non-federal entities are limited to hauling dredged material by truck to upland areas. “We’re talking about small businesses so the additional cost of that is a significant cost on them,” he said. The Corps manages about 218 DMPFs totaling more than 5,000 acres in North Carolina. Some of those sites have not been used. “We’ve got a couple we’re worried about,” said Justin McCorcle, an attorney with the Corps’ Wilmington district. One facility near Masonboro Inlet in New Hanover County is full, he said. The Coast Guard gave the Corps $1 million to raise the dikes at a facility near the Southport Marina in Brunswick County. A majority of the federally maintained dredge disposal areas in North Carolina are state owned, but the easements to the Corps are in perpetuity. Neal said North Carolina is behind other coastal states like Florida and New Jersey, which have historic dredge disposal site management plans. The idea, though, is for North Carolina to eventually have its own dredge management plan. “We have short-term issues that need to be resolved and then we’re working on a long-term plan down the road,” Riely said. NCBIWA is requesting a five-year grace period for the Corps’ Wilmington district and the state to work together to create such a plan. “What we would like to do is propose something in unison with the district and the state,” Neal said. Part of the work will be getting a handle on how often the sites will be used and how much material is expected to be disposed of within the sites.